This classic takeout favorite is so quick and easy to make at home you’ll forget where you put the takeaway menu. Tender flank steak with crisp broccoli in a savory Chinese brown sauce with garlic and ginger, all made in well under 30 minutes. Plus I share my secret for getting the best and most tender beef at home. 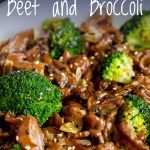 If beef and broccoli is your favourite PF Changs or Panda express order then this quick stir fry is going to be your new favorite simple dinner. Chinese has to be my favorite takeout! When I was a student I loved the Chinese buffet restaurants, but with limited funds I had to find alternatives. Whilst I was working nights as the room service waitress in a local hotel I was taught by the Chinese night cook how to make some of my favorite takeout foods at home. He had some great tips and I want to pass them all onto you! Firstly did you know that most of the takeout dishes we love aren’t even true chinese dishes, they have been westernised to suit our palates and make heating up leftovers easier!!! 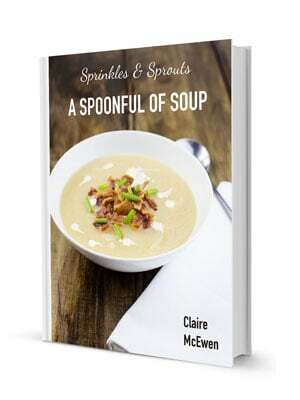 Which leads us onto one of the most asked questions about cooking takeout style food at home. 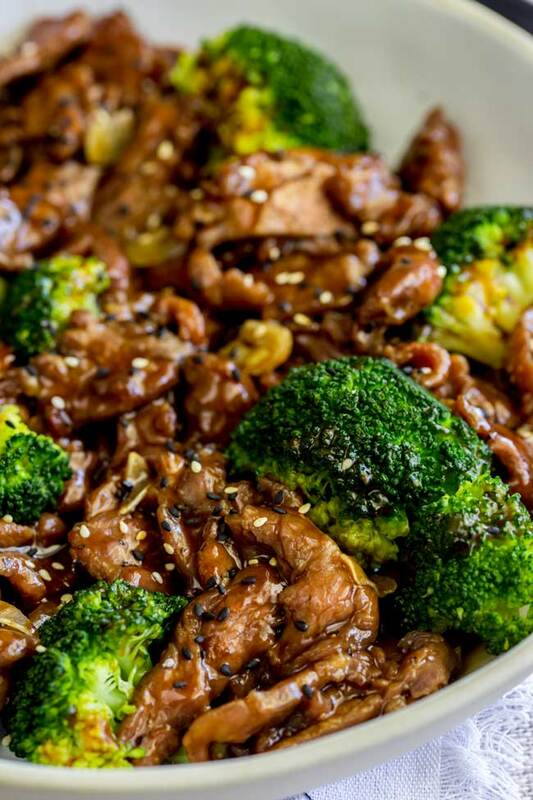 Do you need a wok to make Beef and Broccoli? The short answer is no, in fact I recommend using a large heavy based fry pan or skillet instead. This is because standard kitchen stove tops cannot get as hot as the commercial kitchens our favourite takeaway has. So getting your chosen cooking pot as hot as they do in restaurants and takeaways is impossible. But we want to do everything we can to get as much heat into our stir fry as possible. So a flat bottomed fry pan/skillet will have the maximum amount of pan touching the burner and give you the best chance of a high heat. I have a wok burner in the centre of my stove top, and that allows my wok to sit down into the flame. If you have something similar then that will work well too. But if you have a standard gas stove top or an electric burner then a fry pan could well be your best bet. But do you get the authentic flavor using a skillet? There are some dishes where a wok will give you a more authentic flavor, but these tend to be drier more traditional Chinese and Cantonese dishes. 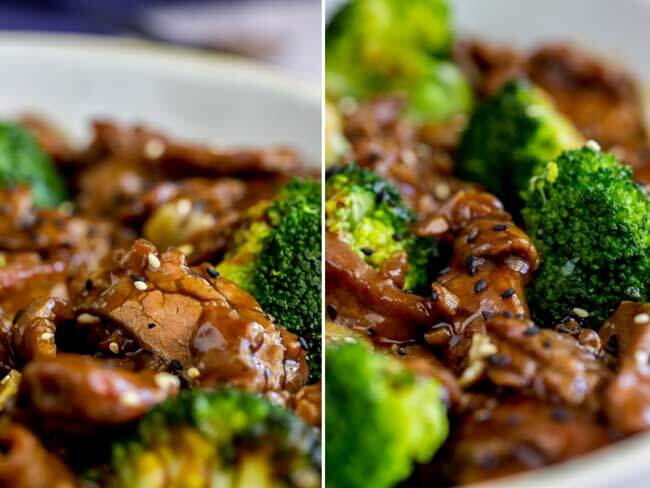 The saucy dishes that we are used to in takeout and chinese restaurants throughout the US and UK, are not as authentic, in fact you will struggle to find beef and broccoli on any menu in China! So cooking them in a skillet won’t result in any loss of flavor. What cut of beef is best for Chinese beef and broccoli? I love to use flank steak or skirt steak in stir-frys. If prepared correctly the meat is so tender and just melts in your mouth. Check out my tips below for the most tender beef you have ever eaten! You can use a rump steak, sirloin steak or even fillet. They will be delicious, but flank steak and skirt steak represent great value for money and can be so delicious and are easy to tenderize. I have two tricks for making the meat super tender! 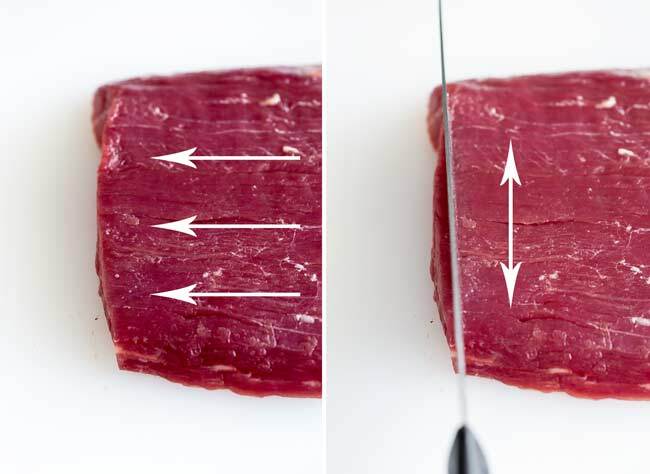 Number 1 – The trick to cutting flank steak/skirt steak (in fact ANY steak) is to find the way the grain of the meat runs and then cut across the grain. This allows the meat to just fall apart in your mouth. If you cut with the grain you will end up with tougher strips of beef. Check out the picture below for an easy visual, see how in the first picture you can see the lines in the meat. This is the grain, and we want to cut across that, as shown in the second photo. Number 2 – The key to softening and tenderizing the meat before you cook it is so simple. This is a trick I learnt back in my waitressing days. 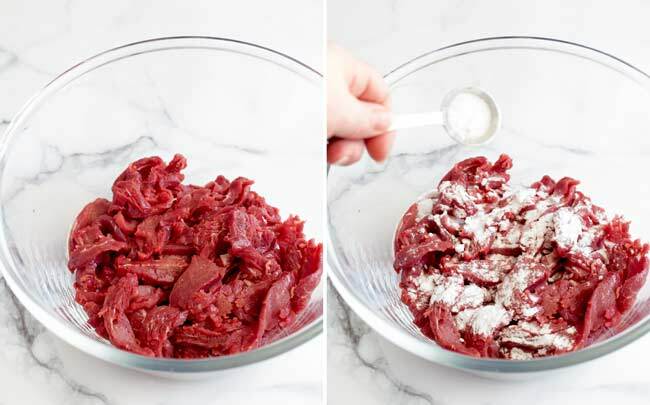 If you sprinkle meat with Baking Soda (also called Bicarb, Bicarbonate of Soda and Sodium Bicarbonate) it will break down the fibres and become so tender. To do this you sprinkle just a small amount of baking soda over the meat and then stir to coat. Then let the meat sit for 15 minutes before washing really well to remove the baking soda. The meat will change color and will be so tender! Pat it dry before you fry it to ensure it gets nice and crisp and doesn’t sweat as you cook it. How do you make that savory sauce taste like a takeout? The key is to use authentic ingredients. Chinese Cooking Wine/Chinese Rice Wine – not to mistaken for rice wine vinegar!!! You can sub in dry sherry if you like. Sesame oil – easy to find in grocery stores now. 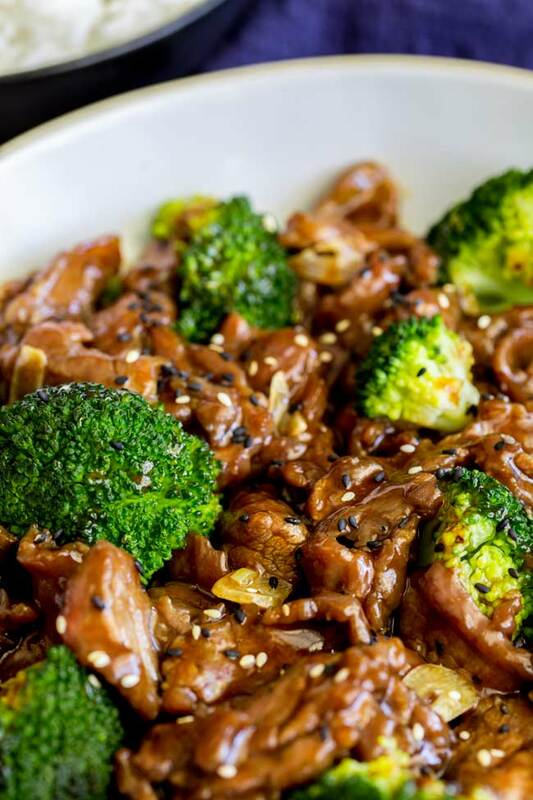 Look at the glossy gorgeous sauce on the takeout style Chinese Beef and Broccoli. It is packed with flavor thanks to those authentic ingredients and it really does taste just like your favorite takeout! Prepare your broccoli, garlic and ginger before you start cooking. Chinese stir frying is quick cooking so you need everything prepped and ready. Don’t let the broccoli or the beef cook for too long, you want everything to be crisp and just cooked. For a truely authentic flavor invest in the ingredients and sauces. It will make ALL the difference. 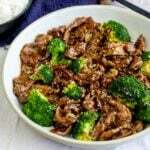 Why not pin this recipe for Takeout Style Chinese Beef and Broccoli Pin it here. This classic takeout favorite is so quick and easy to make at home you’ll forget where you put the takeaway menu. Tender flank steak with crisp broccoli in a savory Chinese brown sauce with garlic and ginger, all made in well under 30 minutes. Plus I share my secret for getting the best and most tender beef at home. 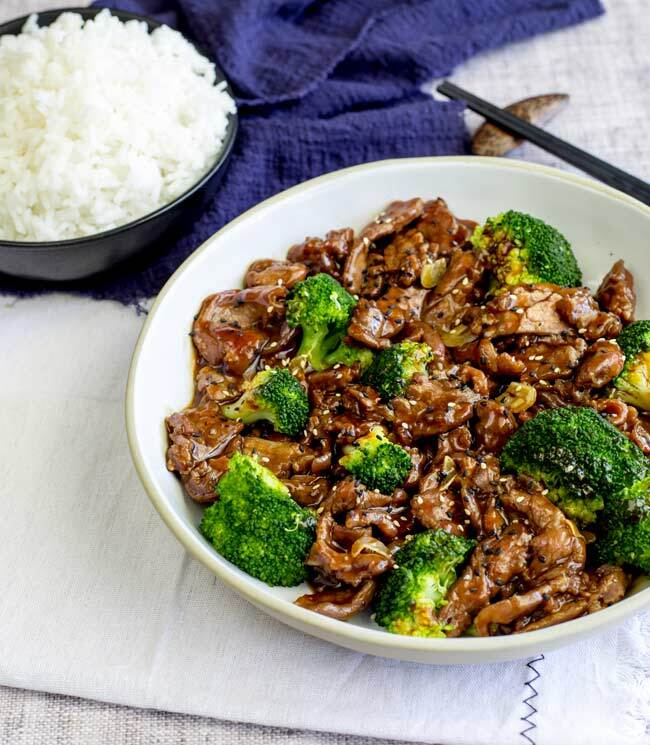 If beef and broccoli is your favourite PF Changs or Panda express order then this quick stir fry is going to be your new favorite simple dinner. Slice beef the beef across the grain, into 1/4″ / 0.5cm thick strips (see bulk of post for detailed pictures) and place in a non-metallic bowl. 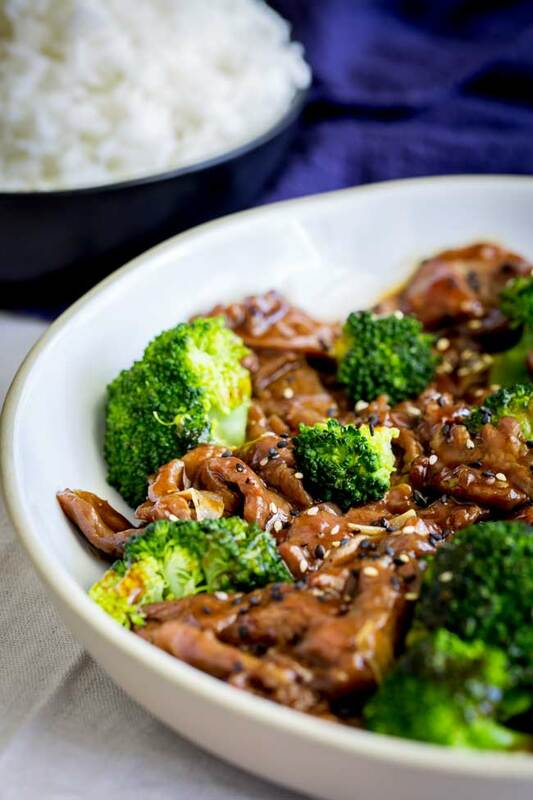 If you love food why not subscribe to my newsletter, I will drop you an email every now and then, just to say hi and send you a couple of recipes I think you might love, like this Takeout Style Chinese Beef and Broccoli. I am sure you will master this one, the method looks quite long but it is quite simple. I am so sad this recipe didn’t turn out. I even went the extra mile and purchased the flank steak. Followed all the steps including the baking powder and the steak was just a chewy mess. Couldn’t even eat 🙁 very disappointing. Hi Mindy, I am so sorry to read this. I think the problem is that you used baking powder. Baking powder won’t tenderise the meat and will make it taste different. The recipe needs baking soda. This baking soda is what tenderises the meat and stops it being chewy, it does need to be rinsed off really well as it doesn’t taste great and it will fizz with the sauce if any traces remain. Then the beef needs to be dried off so you can stir fry it for a minute to get a nice crispy edge to it. I love your tips on how to get beef nice and tender and going to try it next time I cook beef. 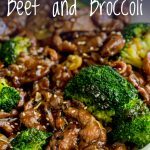 Beef and broccoli is one of my favorite Chinese dishes so this will be getting a workout in my kitchen very soon. This is one of our favorite take out choices, and this recipe Does NOT disappoint! So good. I am sorry to hear that Lyn, I like to recreate the taste of the takeout and I find their sauces tend to have a sweet edge.